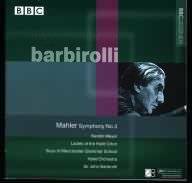 Two months after Sir John Barbirolli's death in 1970 the Mahler scholar Deryck Cooke wrote to Barbirolli's biographer Michael Kennedy to declare this 1969 BBC broadcast recording of Mahler's Third, made under studio conditions in Manchester's Free Trade Hall, "one of the finest Mahler performances I have ever heard" and to inform Kennedy he had been trying to persuade EMI to issue it. Cooke explained EMI were interested instead in a live recording of a Berlin Philharmonic performance by Sir John eight weeks before. "As I didn't hear the German tape," Cooke went on, "I couldn't argue with EMI; but I do know that the Barbirolli-Hallé tape of Mahler 3 is superior to the Barbirolli- Berlin Phil disc of Mahler 9 for two very good reasons: Barbirolli's special relationship with the Hallé and the Hallé's now complete familiarity with Mahler's music. The Berlin Phil may be a finer orchestra, but they just haven't any Mahler tradition - they hardly ever perform his symphonies. 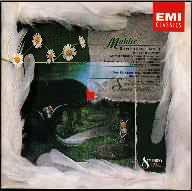 In any case, the Hallé play most beautifully on the BBC Mahler 3 recording and the BBC's Manchester engineer achieved a superb balance, I thought." Nothing came of EMI's plans. Years after Cooke's death, an aircheck of the Berlin recording allowed us to hear what Cooke did not. Now, almost 30 years after, we can hear what it was in the BBC recording that so impressed him and decide whether his instinct in preferring this was correct. I can tell you it was and for the reasons he gave. While there's no denying the Berlin Philharmonic has greater tonal élan and depth, the Hallé's grasp of the idiom, allied to their empathy with the man who had been their chief for twenty-seven years, is complete. In addition, there are times when even the famed Berliners' prowess is tested to breaking point where those same passages are negotiated by the Hallé with aplomb. Sir Simon Rattle's new recording followed live performances too. This time at Symphony Hall in Birmingham and must have benefited from that also. Though where the Hallé recording would have been taped "as live" the Rattle has signs of being a more carefully prepared affair and perhaps some spontaneity is sacrificed in exchange for accuracy when the two are compared. Rattle's sound recording is rich, deep and well-upholstered. Very much concert hall balance with a wide spread left and right and good front-to-back perspective. Barbirolli's, on the other hand, is closer-in, almost a conductor's balance with every detail of the score clear. Some may find the balance of the brass troublesome as there's no doubt they're favoured. But with superb 20-bit remastering it all now comes over bold, brassy and exuberant. Rather like the symphony and Sir John's interpretation of it. To execute a successful Third the conductor has to do two things before anything else. First, realise that, in spite of the fact that the work falls into Mahler's "anthologising" strand (along with Klagende Lied, the Second and Eighth Symphonies), the overriding structural imperative linking the six movements is a pattern of ascending steps based on the concept of the evolutionary ladder within Pantheistic cosmology. In general terms 1] Inorganic nature, 2] Plant and vegetable life, 3] Animal life, 4] Human life represented as spiritual darkness, 5] Heavenly life represented as childish innocence, leading to 6] God expressed through Love. The conductor who fails to see this "ladder of ascent" is one who, among other things, makes the mistake of concentrating too hard on getting the first and last movements right and neglecting the movements in between; treating them as interludes rather than steps along the journey to perfection fashioned out of the world around and beyond. But that isn't to say the first movement does not have a degree of independence from the others. Mahler designates it Part I with the remaining movements Part II. This leads to the second thing the conductor must do and that is render the disparate elements of the first movement into a whole when the nature of its thirty-plus minute length sets it on course for structural failure. What it comes down to is the necessity for no presence of doubt on the part of the conductor as to the movement's greatness. A hard thing to quantify. It's something you know is there at a very deep level at certain "way points" in the movement and in the way you can give in to its atmosphere, hallucinatory qualities, its own lack of doubt in itself. I think it's also true that a conductor's confidence in the rightness of Mahler's vision in the first movement stands him in good stead for the rest, because those conductors who get the first aspect right tend to get the second right too and I believe Barbirolli and Rattle are of that number. No matter what observations one might care to make about their treatment of sections, matters of phrasing, dynamics and expression, their vision of the work as a journey upwards in a series of steps is undiminished, as too is their grasp of the first movement's totality and their lack of doubt as to its worth. With Barbirolli the opening on all eight horns is bold in sound, vigorous in delivery, rude and raucous. The clear recording also allows us to hear the grumbles on percussion as primeval nature bestirs. But the uprushes on the lower strings during the opening "Schwer und dumpf" section are disappointing. It isn't as if they seem "out of phase" as in the Horenstein recording, rather the favouring of the brass reduces their impact when compared with recordings where they are made to "kick" at this point. The section at 132-147 which introduces Pan as he sleeps contains a ripe delivery of the big trombone solo and when other members of the section join, forward and close-miked, the effect of their lament comes over as black as doom. You may hear more cultured playing from great international ensembles but there's no denying the corybantic edge of the Hallé players. Rattle's horns open the work with more sense of space, physical and musical. Each note is spaced out more deliberately and the horns themselves sound more elemental, less penetrating. Overall the brass of the CBSO are much more cultured and cushioned than the Hallé. There's no doubt they offer a better blend but there is some loss in character, especially the trombone solos which are very well-mannered indeed. The strings are better balanced in the Rattle recording too and there appear to be more of them. This means that the uprushes from the lower strings really shudder from the very depths and offer what is missing in the Barbirolli recording. The principal role of what passes as Exposition is the delivery of the huge march meant to signify Summer's arrival. Mahler loved his marches and this one is his most energizing. So it comes over under Barbirolli. More important is the way he gives the impression of the march beginning from a distance, getting nearer, then, as it goes past, sweeping us along. The moment of its arrival has a particular quality which I can't imagine any other orchestra bringing. If Mahler was inspired by workers in Vienna, Barbirolli seems to have in mind the holiday resorts in the north of England at the height of Summer. There's about his rendition a hint of the Promenade at Blackpool with the whiff of fish and chips, the sun catching the silver paper on the "Kiss Me Quick" hats and the taste of petrol from charabancs depositing mill girls from the looms of Manchester. Rattle's march is finely done also. In terms of tempo and weight grander than Barbirolli. But I think it's missing the latter's greater sense of the approach from the far distance and also has less impudent swagger. Then at 347 we are dragged back to the natural world with all its force and splendour as the horns roar out a theme from back at the start, and the Development is underway. I like the way Barbirolli balances his brass sections in what follows. It shows the value of the orchestra having played in a couple of live performances before the recording, adding a sense of security. The important passage 530-642 is where Mahler develops on the idea of marching and marks each section differently, something a conductor must take note of. "The Rabble", "The Battle Begins", "The South Storm" are all acknowledged and this has the effect of making the music seem to comment on itself - an extraordinary concept. Under Barbirolli I was also put in mind of some of the wilder sections of Ives in the way the marches, broken down into constituent moods, criss-cross in a mesmerising half-nightmare. In the passage leading up to this I felt Rattle could have learned a lot from the example of his older colleague. Barbirolli never loses track of the plot here where Rattle seemed to. He redeems himself in the "Ivesian" section but then lets the music sag again in the long, dreamy section before the march resumes for the Recapitulation. With Rattle my attention wandered here where with Barbirolli I remained riveted - a benefit from the fact that Sir John did the whole movement in a single take, perhaps ? Apart from this, there is some really lovely playing from the Hallé cellos prior to the return of the march proper. Their portamenti a quintessential Barbirolli fingerprint we will hear more of in the last movement. All this is swept away because the march has one more appearance, shorn of Ivesian nightmare, again emerging from a distance, approaching and arriving in our midst. This second time I was even more aware on the Barbirolli of the long crescendo that will bring about a conclusion to this extraordinary movement. The frenzy of the end itself, starting at Figure 74 where the orchestra explodes into wild and crazy vistas, is well brought off. Though not even Barbirolli can match Horenstein on Unicorn-Kanchana, whose LSO brass are absolutely shattering. Rattle cushions the climaxes a little at the end. One gets the impression he might be wanting to save something up for the end, not fire off all his bullets too soon. I've heard recordings where the interpretation of the second movement is such that the conductor allows it to barely peep out from beneath the weight of what preceded it. A pity because the second movement is subtler than is sometimes realised. For it to make an effect as part of the whole the conductor must lavish the same care on it he would everything else. Barbirolli's walk through the flowers in the meadows doesn't take the pretty route all the time. There are stinging nettles beyond the blooms and we stumble into them quite often in the way the woodwind allow spiky sounds to come through. The rhythm is also nicely pointed when the tempo picks up. Which means when it relaxes into lyricism the effect is that much more nostalgic. With a slightly broader tempo Rattle can point up more details too, but I think he loses some of the bite that Barbirolli gives it, some of the sting. There is a gain here and that is in the impression of dreaminess: a more continental landscape, perhaps. It has to be said Rattle demands and gets more portamenti from his strings in this movement, the kind Sir John would have approved of. Barbirolli adopts a very slightly slower tempo in the third movement than we are used to, but this allows a little more room to make rhythmic points and to bring out the character of the piece. I don't think I've heard the rollicking brass descents at two bars before Fig 9 and likewise before Fig. 23 delivered quite so loud and with such precision. Barbirolli must have drilled his players meticulously here and their contributions come off superbly. Rattle has nothing approaching it, but then, by now, such a sound would have been out of place. The crucial posthorn episode, our first tentative glimpse of humanity, is beautifully prepared by Barbirolli, but the first posthorn is a little disappointing. The player is fine, the problem is he's too close to make that dreamy effect Mahler wanted. However the section between the two appearances of the posthorn makes up for any misgivings by being raucous and loud. You gain the impression that the orchestra are really enjoying themselves here. The second posthorn solo is placed further away, but this is where he should have been the first time around. The opening woodwinds of the CBSO for Rattle show more character than their Hallé counterparts and they are more cultured and refined. It's really a question of taste as to which you prefer. Rattle is also anxious to luxuriate more in the details of this movement where Barbirolli is the more extrovert. This leads to an unforgettable delivery of the posthorn solos in the Rattle recording, exactly what was missing in the Barbirolli. The lead up is given a deliberate slowing down too. In the live performance it was a piece of concert hall "theatre" worthy of Furtwangler. In the recording the player impinges into our aural imagination from a huge distance, sounding as if he is out of the hall altogether, on the top of the Rotunda surveying the Bull Ring, perhaps; serenading the Balti takeaway queues and the traffic jams around New Street Station. In the interlude between the two Posthorn passages Rattle then coaxes his muted brass players to cluck like an expectant hen house - "What the animals tell me", indeed. If the posthorn represents the first appearance of humanity, raw nature has the final word with the passage at bars 529-556: a crescendo from ppp to fff followed by a diminuendo back down to pppp, replete with harp glissandi. This passage has at its centre a development of one of the bird call motifs to become "The heavy shadow of lifeless nature" rearing up on horns and trombones, all fecund strength. It links back to the first movement and forward to the end and is a key moment of crisis which should be marked with special emphasis. Barbirolli prided himself on being able to recognise the highlights and climaxes in each Mahler symphony and there's no doubt he gives this passage everything it can stand with a huge rearing-up of sound whose mood doesn't lift even through the dash to the end where darkness now beckons. Rattle is more reined-back in this passage and, in comparison with Barbirolli, disappointed me rather. He seemed more concerned with the beauty of sound that can be drawn from this moment rather than its earthy, elemental ugliness. But it's a valid point of view and the orchestra certainly delivers what he wants. Under Barbirolli I would have liked more Stygian gloom for the fourth movement, a setting of Nietzsche's "Oh Mensch", the first appearance in the work of the human voice. I think the recording balance must take some blame here. Kerstin Meyer is a fine singer, but you can hear just too much of her for her contribution to be as mysterious as it ought to be. This is not the case in the Rattle recording where the backward depth in the sound stage means that it starts with a considerable advantage, and Birgit Remmert emerges from way back, singing with greater insight into the words and character of her part than Meyer. The difference that another generation of Mahler performing brings ? The biggest difference with Rattle is that it's in this fourth movement his renowned concern for bringing out every detail of the score leads to a controversial decision. There is an important solo part for the principal oboe and Mahler's instruction to the player is "hinaufziehen". I'll just say I have never heard an oboist play his/her contribution in this movement quite like this. A friend who was at one of the live performances described the sound produced by CBSO principal oboe Jonathan Kelly as "an extraordinary upwards glissando". It sounds to me like a Tom cat on a wall mewing for a mate on a warm Summer's night. Rattle may have interpreted exactly what Mahler asks for, (or he may not), but hearing something I'm so familiar with played in a way I'm so UNfamiliar with makes me wonder whether this is a case of "an unsightly carbuncle on the face of an old and dear friend": a detail too far. With Barbirolli a nice contrast arrives with the boys and women in the fifth movement which is a return to the Wunderhorn world, heralding dawn with bells. The boys of Manchester Grammar School are nowhere near the pretty angels we are used to elsewhere. These are urchins from the mean streets of Manchester and they give an earthier quality to match the purer sounds of the women and the darker tone of Kerstin Meyer. Rattle adds girls to his boys and so there is a difference between his fifth movement and many others too. In comparison with Barbirolli there is more warmth overall but less contrast. I prefer Barbirolli's unvarnished honesty, though Rattle's orchestral accompaniment is very telling. For the last movement to crown the work perhaps something more spiritual, more inner ,is needed than what Barbirolli delivers. Compared with some Barbirolli is more expressive, moulded, given to "heart-on-sleeve". But one is overwhelmed by the big-heartedness of it as a true journey's end that couldn't have been won by this conductor any other way. Notice the expressive rubato, a particular Barbirolli trait, also the singing line of cello portamenti, another speciality. The Hallé could do all this almost by telepathy by then so it's no wonder it's in the last movement the Berliners sound under strain. Barbirolli's inability to resist speeding up at moments of release later on in the movement also spoil this movement's serenity a little. But take that away and it would not have been a Barbirolli performance. So accept it and go with it. The end is built to masterly fashion within Barbirolli's warm-hearted view. Again he presses forward in the closing pages a little harder than is comfortable and he can't resist almost a luftpause before the last chord of all. Rattle is more restrained than Barbirolli in the last movement and, I think, for the better. He has a degree of expression a few notches beneath Sir John's and does supply more of that inner spirituality the movement benefits from. He doesn't slow up too much, though. He agrees with Sir John the movement should have an ebb and flow, but his ebb and flow is within narrower limits. The string players in Birmingham have more weight of tone too and seem better able to deliver a true pianissimo and more levels of dynamic than their Manchester counterparts who were, perhaps, given a separate agenda. At the close Rattle reins back his tempo where Barbirolli presses forward and the end under him is perhaps a degree or so more satisfying, even though with Barbirolli you are still aware of the end of an epic journey and an end that satisfies just as much but in its own way. If you are looking for a modern version of Mahler's Third, superbly recorded and played, with a care for detail that takes you deep into the complexities of this remarkable work, look no further than Rattle. (Though be aware of that oboe in the fourth movement.) But if, like me, you already have one of those and are looking for a record of one of the great Mahlerians of the previous generation in this particular work (to go with Horenstein, Kubelik and Bernstein, perhaps) you must have Barbirolli. His potent mixture of experience and emotion is a special event you will return to often.